Finch enthusiasts are in the enviable position of being able to easily obtain a wide range of interesting, colorful and unusual species. Among no other group of cage birds do we find such a variety of captive-bred specimens. Although some are quite delicate, even those relatively new to the hobby can find a great many hardy species. Today I’d like to provide a look at some of the possibilities. Measuring a mere 3 inches in length, this delightful little bird is the smallest of the Australian grass-finches. It inhabits grasslands, parks and gardens; wild and captive individuals alike are quite comfortable around people. Bicheno’s finch is clad in browns, fawn and gray, and the buff colored face is outlined with a dark, almost heart-shaped ring – bringing to mind a minute barn owl (well, actually I’m referring here to my mind, I’ve not had others second that opinion!). Despite its diminutive size, this finch is quite steady in disposition, and makes a fine, always curious pet. These finches are much inclined to scratch about the ground for insects…providing a pile of leaf mulch will keep them occupied and yourself amused for hours. Clad in green, blue and bright red, this most desirable of the parrot finches occurs from Myanmar to Java. Nonpareils are bred in large numbers, but remain a species best kept by well-experienced aviculturists. They are fairly high strung and tend to crash into walls and cage bars when startled. For that reason, they are best kept in spacious, well-planted aviaries. 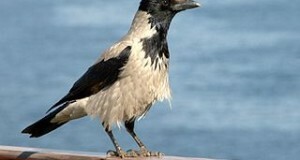 For some reason, males greatly outnumber females, and hence true pairs are difficult to obtain. Nonpareils require more dietary variety than many other finches, with soaked rice, insects and greens, along with a variety of seeds, being necessary for their well-being. The beauty of this central Indian waxbill is less flamboyant than that of many other finches, but no less arresting. The grassy-green of the back blends nicely with the yellow-gray throat and grades into lemon yellow, black barred under-parts, offset by a brilliant red beak. Green Avadavats are birds of grasslands and sugar cane fields, where they construct enclosed nests of grass and hay. Captives sometimes accept hanging, covered nests, and are generally good parents. 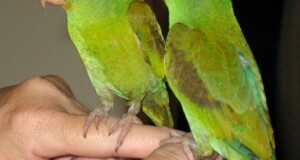 Although hardy once acclimated, green Avadavats are intolerant of damp conditions, and require a steady supply of small live or canned insects if they are to remain in peak condition. These odd finches do indeed resemble minute quails in body form, coloration and habits. They keep to the ground, even nesting there, and, like their namesakes, explode upward in whirling flight when startled. Quail finches of one or another species inhabit much of Sub-Saharan Africa, usually in association with bogs, swamps and other damp environs. These stout little birds do poorly in open situations in captivity, but settle down well if provided with ground cover in the form of bushes and live or dried grass clumps. 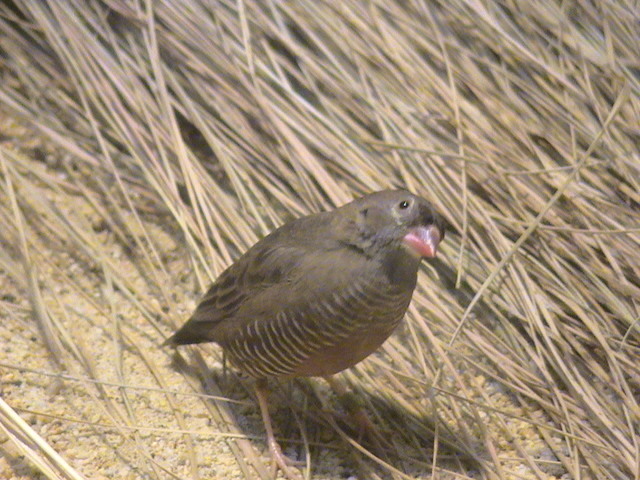 Quail finches feed on the ground, and should ideally be offered live or canned insects and egg food on a daily basis, especially during the breeding season. Read an interesting account of one aviculturist’s success in breeding the quail finch. I’ve written about a number of other finches as well; please see The Gouldian Finch and the articles referenced there for more information. Double-barred Finch image referenced from wikipedia and originally posted by Glen Fergus. Pin-tailed Parrotfinch image referenced from wikipedia and originally posted by Barracuda 1983. African Quailfinch image referenced from wikipedia and originally posted by Magnus Manske. Here’s some news about my little strawberry finch that was fostered by my pair of owl finches after his parents laid their eggs in the owls’ nest. He was very lucky because his was the only egg that hatched our of all the owl and strawberry eggs in the nest and his natural mother died shortly before he hatched. The owls are quite shy during feeding so I couldn’t get close enough to take a photo of them feeding him. He is doing very well, is now flying around with all the adult birds and is eating on his own. His owl parents have stopped feeding him altogether now. I will let you know as he grows older whether he develops owl or strawberry finch habits, but indications so far are that he is 100% strawberry. He doesn’t sleep in the nest with the owls like the owl chicks do and he likes to stay at the very top of the aviary. His call so far seems to be strawberry as it is quite shrill but too soon to be sure. He does’t cuddle or groom his owl parents like I’ve seen owl chicks do. young but all four are very good parents. The first chick jumped out on Sunday but has gone back into the nest today with his two siblings, lazy baby 🙂 The other clutch of 2 is doing well and are about a week old now. Will keep you posted re my little strawberry. Nice to hear from you…thanks so much for taking the time to post here. it has been most interesting to communicate with you via email, I’;m happy that others can now learn about your unique situation. I can’t find any records of owl finches raising a Strawberry chick, so your notes will be very useful. I’ve fostered various birds of prey and Pink Pigeons with species other than their own (zoo collections), with mixed results. Sometimes, fostered young will pick up the calls and even behaviors of the foster parents, while in other cases they seem not to. A hand-reared Great Horned Owl rejected others as he matured, preferring to court his keepers with mice during the breeding season (common with human raised birds). Lots of interesting work with mammals as well..Gaur/Cattle, rat/squirrel, black bear/dog. In most cases, the fostered animals have trouble mixing with their own species, as they fail to learn impt behaviors/responses. Looking forward to updates when time permits. Good news is that my first 3 gouldians are all out of the nest, the next clutch of 2 should be out by the end of next week and I’ve got a clutch of 4 one week old chicks. The first thing I wanted to tell you is that the smallest of the 3 that fledged is still begging for food. Although the other 2 chicks are eating on their own, the parents still feed them. I noticed yesterday that the smallest chick was begging for food from his oldest sibling. This morning I saw the 3 chicks begging for food and the father fed the 2 bigger chicks but refused to feed the smallest one over and over. The biggest of the chicks then proceeded to feed his smallest brother and gave him a very good feed, not once but several times. This is very sweet but is this normal and why is the father not feeding the smallest one? Could this be because he is not trying to eat on his own like the other 2 chicks? I have a dilemma about my youngest clutch. 5 eggs all hatched but the father started tossing the chicks. I put the chicks back in the nest but one chick didn’t survive. I put a separator in the cage and the mother is caring for the remaining 4 on her own. She is doing a great job because I peeped in this morning and all four are a good size (9 days old today). I had hoped to remove the separator after a few days but each time I tried the male would fight with the female and every time he went to try and go in the nest he would get a fright and fly away. Seeing that he was fighting the female and she was getting upset, I put the separator back. I also didn’t want him going in the nest and perhaps killing the chicks. I’ve decided that it’s best to keep him separate but am concerned that if all goes well, when the chicks come out of the nest, the cage will be too small for the mother and 4 chicks (it’s half the size because of the separator). So…my questions are, should I be persisting and allowing the father supervised visits till he gets used to things in the hope that he settles down? I’m not too happy that the female is having to cope with 4 chicks on her own even though she’s doing great. If I leave things as they are, will I be able to remove the separator once the chicks fledge, or is it likely that the father will be aggressive? Thanks very much for the strawberry finch update…sorry about the death, but glad the chick is coming along; it will be very interesting to see what happens when you intro another. Fascinating observation on the Gouldian fledgling. More and more info on avian social behav is coming to light. Scrub jays and some others have long been known to stay around, help raise siblings, but it seems that others do as well. Parents often seem to be on a :”schedule”/internal clock, re feeding and incubation, and will cease both at specific times, although there is flexibility. Siblings taking up the slack is quite another matter; I’ll keep your info on file and forward to others, and will update you if I hear related news. I wouldn’t try to reintroduce the problem male…hard to say why this happens, but I’ve not seen reintros work out well with other fincehs, other types of birds. Captive conditions and breeding history changes many things that we cannot always understand, re breeding behavior (I see this in reptiles, mammals, fish as well). She’ll probably do fine, although she may not “want” to repeat the feat! I have an update on the fledglings that were feeding each other. First of all they are all very independent now and are in a flight cage with the other youngsters. The smallest which was being fed by his brothers started feeding the latest fledglings I put in a few weeks after them. Very sweet. My partner Joe also breeds gouldians and has an aviary at his own house with quite a few gouldians. One of the pairs had chicks and we noticed that apart from the parents, there were other gouldians going into the nest and feeding the chicks. These gouldians were a female and a male (not a pair and neither of them had any nests or chicks as they are still quite young). The father didn’t like this and would chase them away when he noticed but the mother was fine with this and even allowed the other female to sit in the nest’s porch while she was in the nest with her chicks. This went on even when the chicks starting jumping out of the nest and they were being fed by the parents and 2 other females and 2 other males. We thought this was really strange, even more so since when the last 2 chicks jumped out none of these adults wanted to feed them and one died and the other is being hand-fed by Joe. Well I’ve got another pair that tossed their chicks so in went the separator, but this time the father is back with his family as he is behaving and is feeding them too. The other family that were tossed are ok but out of 4 chicks, only 2 have survived and they are now starting to eat on their own. 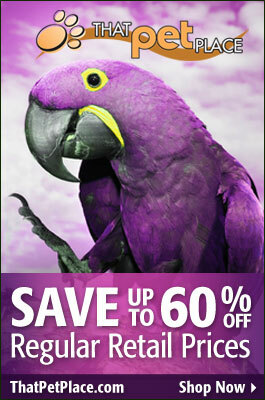 Do you remember the silver gouldian that was having fits but got better? Well he’s fitting again and I took him to the vet who has no idea what’s wrong with him so gave him a broad spectrum antibiotic in case it’s an infection and vitamins in case it’s his nervous system BIG SIGH same old story, nobody here has any idea about birds. I took another gouldian to the vet at the same time because she lost the feathers on her face, from under her eyes right round, basically the area of the mask except for the top of her head. The vet checked for mites but she doesn’t have any (I knew that) and said her skin is heathy. Once again he said he doesn’t know what’s wrong and has never seen anything like it. He prescribed ear drops, as the only thing he could think of was that perhaps she had an ear infection – again BIG SIGH 🙁 Well I’ve treated her and there is absolutely no difference so I’ve decided to stop all treatment and give her vitamins that promote feather growth. Since she is otherwise perfectly fine, good apetite, not upset, not scratching, not poorly at all, I think this is the best way to go. What do you think? Is there anything you could recommend I do for her? The silver gouldian….no difference there either so I just make sure he is comfortable and hope he will get over it again. I hope you don’t mind me telling you all these stories but I find them so fascinating and sometimes you don’t find anything on the internet that is similar to what your birds are experiencing. Strawberry finch confirmed a male, singing away so sweetly. He is keeping his owl father company most of the time. The owls are in the nest again, will see if there is any reaction from the strawberry once their chicks are out. Thanks very much…your observations are unique and very interesting as well as useful, please keep them coming. I can;t wait to hear more on the owl-strawberry story! Unfortunately, fits are very difficult to diagnose, and antibiotics are usually the route followed when the cause is unknown. Feather loss often presents with symptoms of lice, mites, fungus – things you’d recognize, If not, perhaps there is a genetic/developmental problem..I’ve suspected this from time to time, once such was confirmed via DNA work at the zoo (rails that had originated from a very small founder group, as I recall). Hope all is well. So sorry I didn’t ask about the storm, didn’t know you were in that area and didn’t think to ask. Hope all is back to normal. I am sending you an email with a recording of the strawberry finch. He is turning red now and I’ve got him a female, he sings away but his song is nothing like his father’s was. His father had died when he was very young so he has no strawberry finch to listen to. I found a recording on Youtube and will start playing it to him. He has a brother/sister owl finch and they are in the nest again but he is now completely attached to the mate I got him and doesn’t hang around the owls any longer. The silver gouldian died, poor baby and I recently had another gouldian with the exact same symptoms. Didn’t bother with the vet this time, just let it run its course and he is fine now. His fits were not as severe as the silver one so I’m hoping he is completely recovered. (Gouldians) Some time ago I had told you about a clutch where the fledglings were feeding each other as the parents weren’t feeding the smaller chicks. Well they had another clutch and did the same thing, this time the smallest chick died. The father was actually attacking her. In both cases the chicks were the only yellow ones in the clutch. They had another clutch of 4 and all were yellow and this time they just started feeding them but wouldn’t sit on them. I have concluded that they reject yellow chicks, the father is yellow, perhaps I should give him a mirror 🙁 I managed to save only 1 of them at two days old by putting her with another clutch that had just started hatching. This pair had 7 ‘good’ eggs of their own but I took a chance anyway. 5 of theirs hatched so they are now raising 6 chicks. I’ve attached photos of this clutch in the nest. They were in a standard sized nest and I decided to change the nest and gave them a bigger one. Very risky and I doubt I will try this again but it worked, these parents are very dedicated. You will see the odd one out in the nest, the little adopted yellow girl 🙂 I hope all goes well and they all fledge in the coming week. Oh and by the way, I’ve seen other fledglings feeding each other, usually the biggest feeding the youngest, although they were being fed well enough by the parents. I also have another adopted chick, also yellow. I had a pair that were laying but never sitting on their eggs. I had another pair that laid 3 eggs and threw 2 out, so I put 2 of the other pair’s eggs in their nest and definitely 1 hatched. They have 2 chicks, 1 may be theirs but the other is yellow and definitely belongs to the other pair. I’m also experimenting with 2 pairs that have been laying and sitting on their eggs clutch after clutch but they never hatch. Timing was right so I gave them each a couple of eggs of other birds that laid but weren’t interested in sitting. The eggs are fertilised and I will let you know how it goes. I’ve been feeling so sorry for these 2 pairs, so dedicated but no result so I thought perhaps they deserve to have some chicks. One of these pairs had a very successful season last year and raised 3 clutches without problems, this year none of their eggs hatched, I haven’t figured this one out yet. Thanks for your concern,…all is well, spent a good deal of money topping off trees, for safety’s sake, but otherwise fine. Great info…I’ll keep on hand, but please also be sure to keep your own notes…your observations will be very useful; I’ll forward interested people to this info as well.